Can we withstand another week of Bucs’ failures? Can we just call off the last week of the futility? Please? Let's unplug the scoreboard, and let's fold the uniforms and put them away. Let's say last rites over the playbook, and let's shake our heads over the record book. Let's send this mistake-filled, penalty-laden, undisciplined football team home for the winter. Why finish it up against the Atlanta Falcons? Just bury this stat sheet in the loser's graveyard with all the others, and let's call it a day. Go home. There is nothing to see here. The disappointing Tampa Bay Bucs added another chapter in their journey to nowhere Sunday, gift-wrapping a 27-20 loss to the Dallas Cowboys. It was just one more bag of trash on this garbage dump of a franchise. All that remains is to gather up the heads that are sure to roll. Yeah, yeah. Those who are determined to love this franchise no matter how many times it stabs them in the heart will be certain to point out that the Bucs outgained Dallas by 150 yards, and they had more first downs by a 27-16 margin. So what? The Bucs' fumbles and turnovers handed this one to the Cowboys, who were delighted to take it, the stats be damned. us in a bind. At times, we overcame some of them. It’s frustrating to move the ball like that and not get touchdowns. Against good teams, that’s what you have to do." 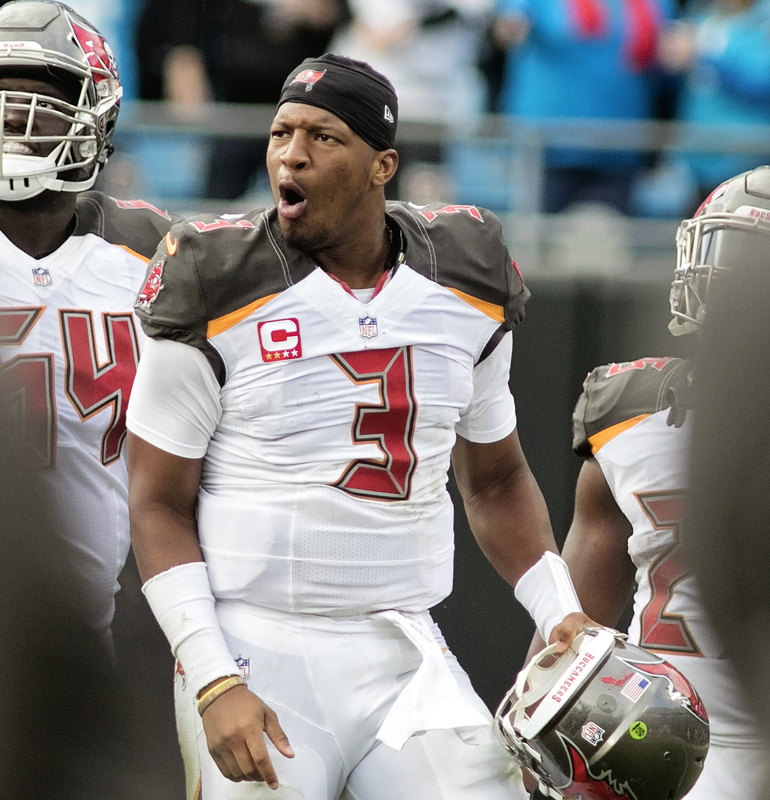 Jameis Winston was charged with two fumbles, one on a strip sack that was returned 69 yards for a touchdown, another when he and Bobo Wilson couldn't manage a handoff. That one set up Dallas deep in Bucs' territory. That led to another touchdown. After that, Dallas didn't need much to beat a once-dangerous offense that has gone into hibernation. By now, it has become a common sight to see the Bucs contribute to their own problems. The Bucs committed nine penalties Sunday, and at one point, drew an unforgivable delay of game penalty when faced with a fourth-and-one at the Dallas 2. The offensive linemen took turns drawing holding calls, which was why so many yards added up to so few points. Consider this: The Bucs had 10 drives Sunday, and they had a penalty on six of them. Their two touchdowns came on drives where they didn't have a penalty. The Bucs were already the fifth-most penalized team in the NFL. So, really, do we need another example of why Dirk Koetter hasn't been able to change the culture? Do we need to see more turnovers, more penalties, more sacks? Haven't we all suffered enough? Do you want to risk your eyesight watching this dysfunctional crew try to find its way to the end zone? The thing is, the Bucs are stuck in Groundhog Day. Every day feels the same. There are always penalties, and there are always turnovers, and the yardage is always greater than the points would suggest. Koetter suggested that was "unfair" to suggest the penalties indicated a lack of discipline. "That team’s a really good rush team," Koetter said. "That team really brings it and we threw it 48 times today.If you’re an offensive lineman in the NFL, your job is to protect your quarterback. It surprised me to see, when I looked at the state sheet, that they actually had more penalties than we did: ten to nine. We had holding penalties. Three, I think (actually four), maybe in the pass game and then one on the long run by Peyton (33 yards). "That hurt us a lot on that drive. Holding penalties aren’t discipline. Those are guys giving their all to protect the quarterback. That’s not a discipline issue. That doesn’t mean you like them but that’s a really good rush team that we played today and our offensive line played their tails off. In a perfect world, we wouldn’t be throwing 48 times but we did." Koetter didn't address why other teams, where the linemen are also trying to protect their quarterback, are being called for holding much less. Once again, the Bucs showed the holes in their makeup. The running backs cannot run (they averaged 2.6 yards per carry). The offensive line cannot block (three sacks and a collection of holding calls). That put the game squarely in the hands of Winston, who promptly dropped it. "Jameis did a lot of nice things today," Koetter said. "They had an excellent rush. Jameis hit his checkdowns consistently. They played a lot more two-deep coverage today than they have in the past. I think part of that was with DeSean being out there, they played more two-deep and then you get behind the chains because of the penalties and that sort of thing. They played more two-deep, which forces you to check the ball down and for the most part, Jameis did a good job today. The defense was okay -- essentially holding Dallas to 13 points -- but it did give up 85 yards to Zeke Elliott and it did force only five incompletions from Dak Prescott. Winston threw it 48 times; counting the sacks and four scrambles, he was called on to pass 55 times out of 75 plays. Clearly, the Bucs struggle to win with Winston, but they have no way to beat anyone in any other manner. Think about it: How many games did the Bucs win this year because of their running game? Their offensive line? Their secondary? As for Winston, he did throw for 336 of the team's 389 yards. The Bucs kept the ball more than 10 minutes than Dallas. With all of that, the Bucs lost. Again. Tampa Bay, now 5-10, closes out its season Sunday at 1 p.m. The Bucs face the Falcons at Raymond James Stadium. If the NFL draft was held right now the Bucs would pick 6Th and the Falcons pick 10th. Is it really that important for them to win Sunday? My point is …why not start Ryan Griffin? Give the fans some excitement! Let’s see what he’s got. And maybe a change can get them out of Groundhog Day mode. It just seems like this last game has no real meaning for the Bucs…like the last exhibition game of the preseason. I am not suggesting they should tank. But doesn’t Atlanta need a win here more than the Bucs? Are we assuming that Dirk Koetter is fired either way. A report on NFL.com said this week that it isn’t determined. In that case, if you’re Koetter, you try to win. Not that trying has done them a lot of good. The other problem is this. Griffin can fool you. If he has a fluke game, he could be the next Scott Milanovich, a player who isn’t as good as fans think. (Milanovich was impressive during a meaningless preseason game and the fans annointed him a contender). I’m not sure if either Atlanta or Tampa Bay needs the win more. They’re both lost causes stumbling in the dark.